This workbook is filled with EASY, NO NONSENSE methods of Buying and Selling REAL ESTATE and NOTES. You will learn how to deal with notes to maximize your profits, and also practical "nothing down" strategies successful investors have been using for centuries. "It blew me away what a powerful tool notes can be. Lots of great information, worth every penny! Highly recommended." .Tom Henderson replied and offered his help. You should use whatever he has to offer, as he is one of the most knowledgeable people in the Note industry". "Learned the calculator. Understand notes much better". "Knowledge of instructor was high. Good examples and stories". "Enjoyed the course very much and was worth time and cost". "I enjoyed the creative note techniques"
"I have just recently purchased and read the "Note Professor Notebook" and found it to be a very worthwhile investment. In my constant search for information, education and new ideas and techniques I believe myself to be so very fortunate to have come across Tom and his material. The ideas are cutting edge... I believe that the knowledge I have obtained from Tom and his material gives me a definite leg up on the competition. 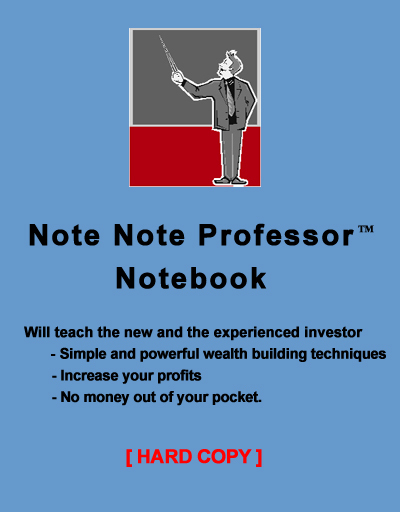 I think that the "Note Professor Notebook" could help many aspiring real estate investors realize their dreams of success. Thank you Tom for you time and effort in putting this all together, and thank you for being so much more affordable than all the other "guru's""